A Surry Hills alleyway is a photograph of children loitering in an inner city, residential street. Surry Hills was a poor neighbourhood in the early twentieth century. In 1900, like The Rocks, it was infested with bubonic plague that was carried on vermin. As a result, the suburb underwent a drastic cleansing and disinfecting process. 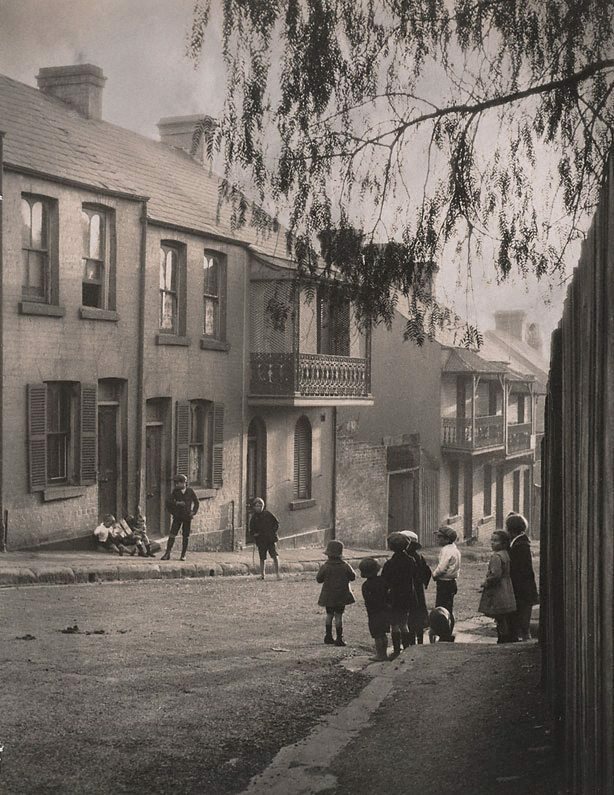 In 1902 the Sydney Municipal Council extended state intervention into Surry Hills dismantling slum dwellings and assessing the quality of the existing terraces, many of which had been illegally extended rendering them structurally unsound 1. Cazneaux’s photograph alludes to the poverty characteristic of the suburb during this period. The young boy in the centre of the frame appears without shoes or a cap. Yet, as Steven Miller argues, Cazneaux’s photography was rarely documentary or topographical, and more frequently concerned with light and form 2. A Surry Hills alleyway is an idyllic representation of children’s play. The low-lying sunlight filters up the street, silhouetting the tree branch that arches through the right side of the frame. The sunlight casts long shadows from the figures of the children in the foreground. Philip Geeves presents Cazneaux's Sydney 1904-1934 , Sydney, 1980, 72, 73 (illus. ).